To the casual observer, it might appear that The Chris Gethard Show is squatting in its studio, rather than working in it. The set is made of barely constructed wall frames, decorated with objects seemingly taken off the street, loose sheets of paper and a mix of backstage junk. This is a welcome sign for fans of the many incarnations of Chris Gethard’s cult talk show. 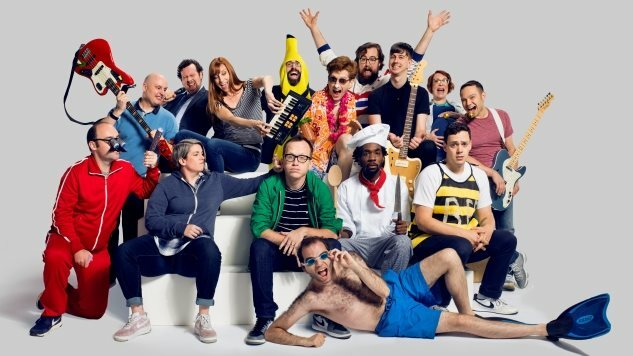 Though TCGS has moved from the Upright Citizen’s Brigade Theatre to public access channel MNN (Manhattan Neighborhood Network) to Fusion before landing at TruTV for a sixteen week run of live episodes, if the set is any indication, the show has brought along as much of its underground past as it can possibly saddle. Every bare spot has been filled with a trophy of weirdness from a previous season. The show is also carrying the weight of the tradition of absurdism in late night comedy, from Andy Kaufman (whose death this show has promised to avenge) to David Letterman. Several set pieces scavenged from the Late Show’s dumpster populate the set as well. Both the George Washington Bridge and the Brooklyn Bridge hang out behind Chris, though he points out other Letterman items stored backstage. “Hunks of metal and stuff,” says Gethard. “Stuff that doesn’t have sentimental value,” but is good to keep around out of respect and karma. “I’ve already gotten questions about ‘how are you going to maintain the DIY authenticity of the show,’” Gethard says to the assembled crowd. “And I understand the irony of that happening at an event where we’re giving you free crab cakes.” The crab cakes are part of a meet and greet organized by the network, as well as a final opportunity of the cast to decompress after a long promotional week before the premiere. Gethard’s sidekick (and artistic director of the Upright Citizen’s Brigade Theatre) Shannon O’Neill is in a trademark hoodie, and Connor Ratliff (Don’t Think Twice, Search Party) has donned the suit he sports as the show’s warm up comic, but Riley Soloner is taking a brief vacation from his character Vacation Jason, and Dave Bluvband has set aside the flippers he wears as panelist the Human Fish. Guests are greeted by an unconventional soundtrack as far as crab-cake-meet-and-greets go—a soundtrack that both reflects Gethard’s punk rock background and tips the hat to friends of the show, cycling through AJJ, Laura Stevenson and the Cans, the Mountain Goats and Jeff Rosenstock. Mikey Erg, a member of Gethard Show house band the LLC, approves of the playlist, and not just because Gethard included two of his songs as well. But the pervading sense in the studio is that it’s still a little crazy this is happening in the first place. “I thought this show was going to die multiple times,” says Gethard. “Our experience with Comedy Central: I thought it was dead after that. I thought it was dead coming out of the Fusion era. It just keeps managing to survive… Going back to public access, too. We once did an episode of the show called ‘Should We Keep Doing This Show?’ And that’s legit with us—we all wanted our fans to let us know what they thought, because we were all stressed out.“ It took a pep talk from Jon Vafiadis, guitarist for the LLC, to convince Gethard to keep going when the going got particularly rough, citing how much the show means to people. I ask Gethard about a show from years back that I felt epitomized his approach to each of these mediums—an improv show called Mike Birbiglia’s Dream where one audience member, in telling the group about a particularly bad day, unpacked her feelings about running into her estranged father while driving a cab (an incident that would later be dramatized in Don’t Think Twice).The story gave way to several scenes before Gethard stepped off the back line and effectively hijacked the show, checked in on the audience member, and gave her the fierce words of encouragement she needed before pulling her into a group hug with the other performers. Watch our interview with Chris Gethard from the Paste Studio. The Chris Gethard Show airs live on TruTV at 11 PM ET on Thursday nights.